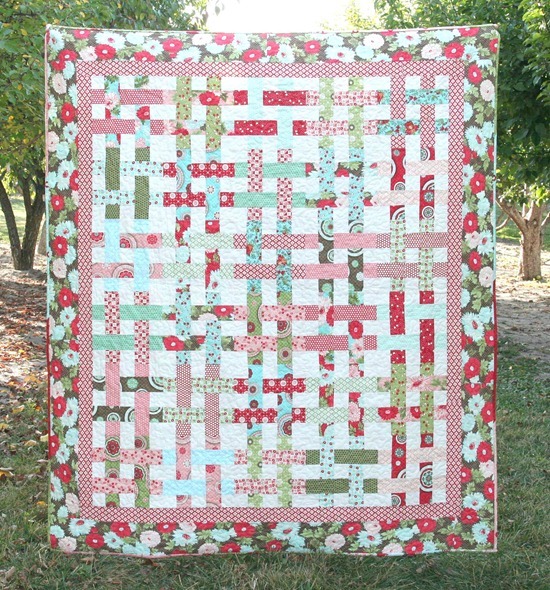 This quilt is made from one jelly roll, plus cream yardage and borders. I wanted a woven look for each block without cutting the strips all into little squares with lots of little seams….so it took a full night of staring at my silly drawings to figure out how to properly do it and make it simple. The fabric line is Bliss by Bonnie and Camille for Moda. The back is the lovely aqua medallions. and the binding is scrappy using the leftover jelly roll strips. The quilt measures 61″ x 71″ . The pattern is suitable for a beginning quilter with some piecing and seam matching skills. And it’s so fun to make! I live under a rock and even I've heard of bliss! Oh, so beautiful, you did a wonderful job. I am lusting after the bliss though. What an impressive pattern! Love it. You do not indicate how much yardage is needed for the backing. I love this pattern! And you should try the chocolate covered acai berries! Those are my favorite…with the blueberries close behind. Even though I don't have the skills to put a quilt like that together, I'm tempted to buy the pattern just to see how you figured out how to do it. Really stinkin cool! I could stare at Bliss all day. Beautiful quilt in a beautiful setting. My Bliss JR is slated for something else already but MAN, this is just gorgeous! I'll bet it looks good in any line of fabric though. this is beautiful…i love it. It is beautiful…love your design! Love that pattern and Bliss of course! Oh, I think I'm in love, LOL!! 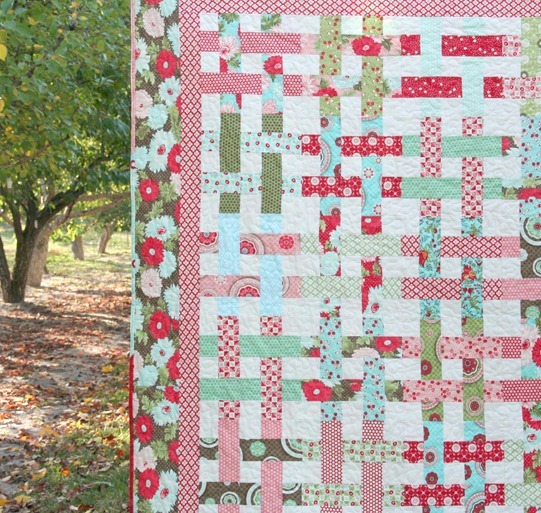 This is one of the prettiest quilts I've ever seen!!! That is beyond gorgeous. Seriously. I am in love with it. You really do make the most beautiful things. Ever. Wow! Gorgeous. I'm thinking I may need to pick up a Bliss Jelly Roll and then I'll be back for your pattern! I dont think I could do such accurate piecing. You need to get the accuracy right to get this so gloriously well put together. Fabulous selection of colors as well. Ha! Sometimes I think I DO live under a rock and can't crawl out! Beautiful design! Love the colors and that woven effect is awesome! 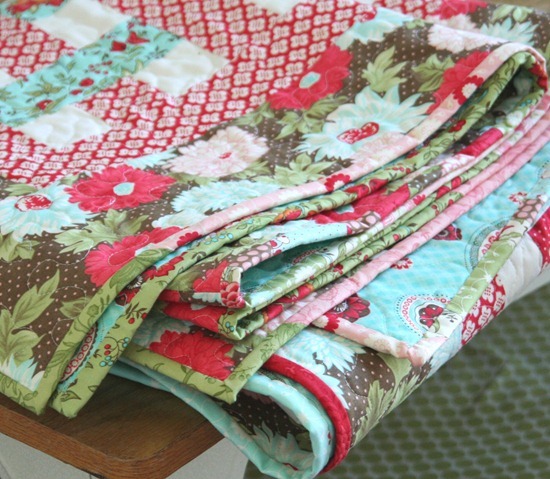 I love this fabric, your quilt is beautiful. 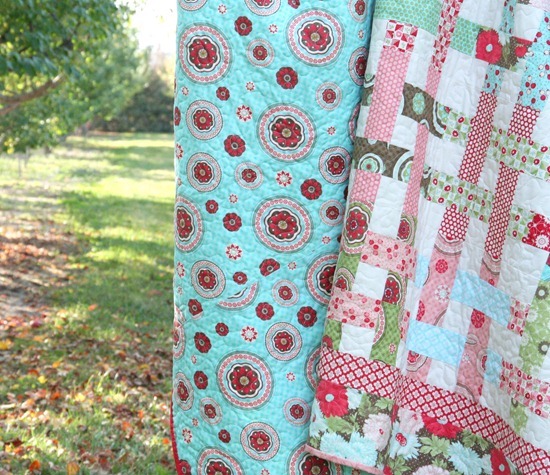 I love this quilt pattern and the fabric is so so pretty. you gotta watch out for those sample ladies lookin' all innocent and such, especially when chocolate is involved! Great pattern & quilt! It's beautiful! How funny, I worked on a baby quilt all day yesterday and didn't stop for lunch because I was snacking on the chocolate covered pomegranates from Costco. They're so yummy but I think I'm a little sick of them now. Your quilt is amazing!! I love Bliss. I am trying to decide what to do with my Bliss charm pack that's sitting here. Just ordered your pattern!! I have the jelly roll for Bliss and have been looking for the perfect pattern….here it is!!!! Oh my goodness, I LOVE this! Love it! This is gorgeous. Your fabric selections are fantastic. So, can we look forward to a tutorial in the very near future on how your weaved this without all the little squares??? This quilt just about took my breath away! I love everything about it! I just bought this and the Modern Chain quilt!